Ever been in the basement when you heard a loud thud followed by a scream by a family member upstairs? You run up the stairs to see what manner of calamity has happened, the climb seeming to take an eternity. Imagine a similar scenario taking place in an industrial setting, where distances to be covered are potentially far greater and the dangerous scenarios numerous. Suppose an employee working near a conveyor system notices that a coworker’s gotten caught in the mechanism. The conveyor has to be shut down fast, but the button to stop the line is located far away in the central control room. This is when emergency stop buttons come to the rescue, like the colorful example shown in Figure 1. Emergency stop buttons are mounted near potentially dangerous equipment in industrial settings, allowing workers in the area to quickly de-energize equipment should a dangerous situation arise. These buttons are typically much larger than your standard operational button, and they tend to be very brightly colored, making them stick out like a sore thumb. This type of notoriety is desirable when a high stress situation requiring immediate attention takes place. They’re easy to spot, and their shape makes them easy to activate with the smack of a nearby hand, broom, or whatever else is convenient. 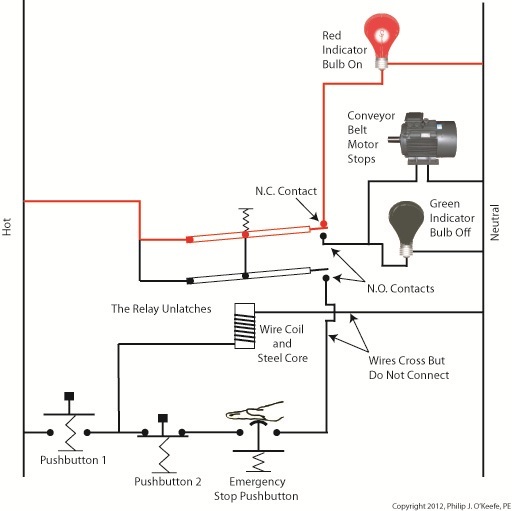 Figure 2 shows how an emergency stop button can be incorporated into a typical motor control circuit such as the one we’ve been working with in previous articles. An emergency stop button has been incorporated into the circuit in Figure 2. It depicts what happens when someone depresses Button 1 on the conveyor control panel. The N.C. contact opens, and the two N.O. contacts close. The motor starts, and the lit green bulb indicates it is running. The electric relay is latched because its wire coil remains energized through one N.O. contact. It will only become unlatched when the flow of current is interrupted to the wire coil, as is outlined in the following paragraph. The red lines denote areas with current flowing through them. Both Button 2 and the emergency stop button typically reside in normally closed positions. As such electricity will flow through them on a continuous basis, so long as neither one of them is re-engaged. If either of them becomes engaged, the same outcome will result, an interruption in current on the line. The relay wire coil will then become de-energized and the N.O. contacts will stay open, preventing the wire coil from becoming energized again after Button 2 or the emergency stop are disengaged. Under these conditions the conveyor motor stops, the green indicator bulb goes dark, the N.C. contact closes, and the red light comes on, indicating that the motor is not running. This sequence, as it results from hitting the emergency stop button, is illustrated in Figure 3. We now have the means to manually control the conveyor from a convenient, at-the-site-of-occurrence location, which allows for a quick shut down of operations should the need arise. So what if something else happens, like the conveyor motor overheats and catches on fire and no one is around to notice and hit the emergency stop? 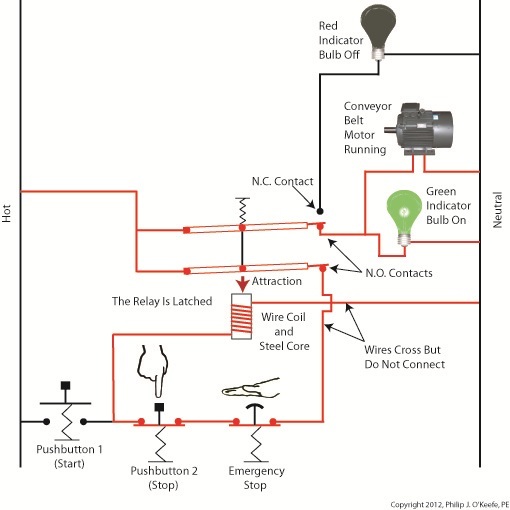 Unfortunately, in our circuit as illustrated thus far the line will continue to operate and the motor will continue to run unless we incorporate an additional safeguard, the motor overload relay. We’ll see how that’s done next time.